Recent regulations on heavy metal testing have required the pharmaceutical industry to monitor a suite of elemental impurities in pharmaceutical raw materials, drug products and dietary supplements. These new directives s are described in the new United States Pharmacopeia (USP) Chapters <232>, <233>, and <2232>, together with Q3D, Step 4 guidelines for elemental impurities, drafted by the ICH (International Conference on Harmonization of Technical Requirements for Registration of Pharmaceuticals for Human Use), a consortium of global pharmaceutical associations, including the European Pharmacopeia (Ph.Eur. ), the Japanese Pharmacopeia (JP) and the USP. 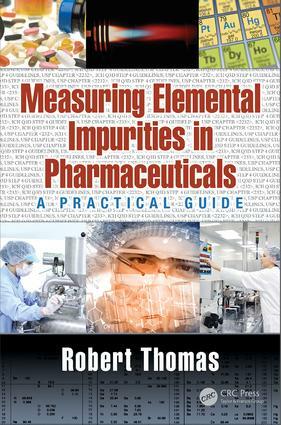 This book provides a complete guide to the analytical methodology, instrumental techniques and sample preparation procedures used for measuring elemental impurities in pharmaceutical and nutraceutical materials. The complete guide to measuring elemental impurities in pharmaceutical and nutraceutical materials. Covers heavy metals testing in the pharmaceutical industry from an historical perspective. Gives an overview of current USP Chapters <232> <233> and <2232> and ICH Q3D Step 4 Guidelines. Describes fundamental principles and practical capabilities of ICP-MS and ICP-OES. Provides tips on how best to prepare and present your data for regulatory inspection. An indispensable resource, the fundamental principles and practical benefits of ICP-OES and ICP-MS are covered in a reader-friendly format that a novice, who is carrying out elemental impurities testing in the pharmaceutical and nutraceutical communities, will find easy to understand. Chapter 23: What Atomic Spectro-scopic Technique is Right for Your Lab? Chapter 24: Do You Know What it Costs to Run your Atomic Spectroscopy Instrumentation?